Town & Country Planning, Nalbari. 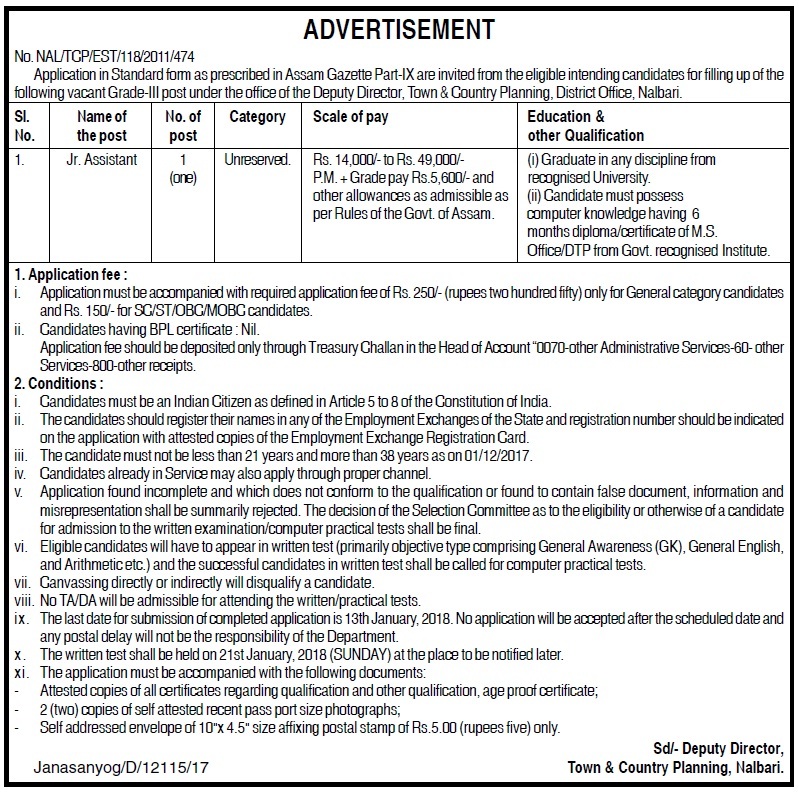 Application in Standard form as prescribed in Assam Gazette Part-IX are invited from the eligible intending candidates for filling up of the following vacant Grade-III post under the office of the Deputy Director, Town & Country Planning, District Office, Nalbari. (i) Graduate in any discipline from recognised University. (ii) Candidate must possess computer knowledge having 6 months diploma/certificate of M.S. Office/DTP from Govt. recognised Institute. Age: The candidate must not be less than 21 years and more than 38 years as on 01/12/2017. Application Fee : Application must be accompanied with required application fee of Rs. 250/- (rupees two hundred fifty) only for General category candidates and Rs. 150/- for SC/ST/OBC/MOBC candidates. Candidates having BPL certificate : Nil. Application fee should be deposited only through Treasury Challan in the Head of Account “0070-other Administrative Services-60- other Services-800-other receipts. The candidates should register their names in any of the Employment Exchanges of the State and registration number should be indicated on the application with attested copies of the Employment Exchange Registration Card. Selection Process: Eligible candidates will have to appear in written test (primarily objective type comprising General Awareness (GK), General English, and Arithmetic etc.) and the successful candidates in written test shall be called for computer practical tests. The written test shall be held on 21st January, 2018 (SUNDAY) at the place to be notified later. - Self addressed envelope of 10"x 4.5" size affixing postal stamp of Rs.5.00 (rupees five) only. The last date for submission of completed application is 13th January, 2018. No application will be accepted after the scheduled date and any postal delay will not be the responsibility of the Department.